It would be nice to let Governor Hassan know how Common Core is failing our children. Unfortunately she does not have town-halls which means that unless you pay to attend a fundraiser for her, it might be difficult for the public to weigh in on this education reform. 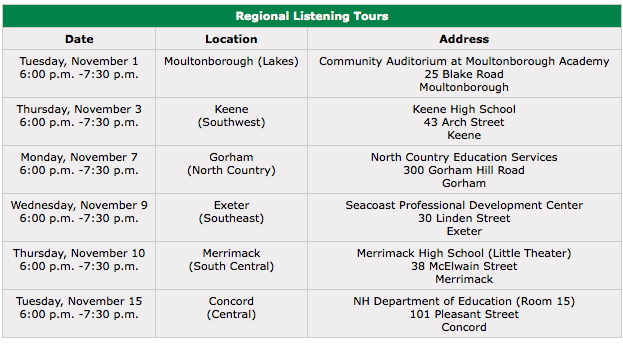 The New Hampshire Department of Education is having a listening tour. This will give parents an opportunity to speak directly to the facilitators of these federal programs in our schools. Take the time to attend one of these meetings if they have a meeting near you. Make sure you take a list of problems you are seeing in your local school. This entry was posted in Parents and tagged ListeningTour, NHDOE on October 26, 2016 by SCC.